By mid-October, a majority of the hummingbirds in the United States and Canada will be on their way back home to warmer climates, leaving behind our backyard gardens and feeders. These flashy birds are intriguing to watch with their aggressive defense tactics, chase games, and their graceful flights to the hummingbird feeder, as shown by the photo gallery. In order to survive their migration to Mexico and South and Central America, hummingbirds need to double their normal bodyweight. Journey North, a global study of wildlife migration and seasonal change, recommends keeping hummingbird feeders out until all the stragglers have left the area. 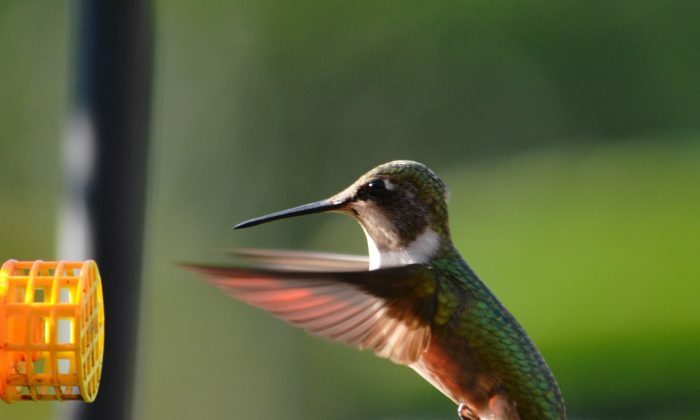 Here are 10 facts about hummingbirds from Journey North, hummingbird expert Melissa Mayntz, and national conservation organization Defenders of Wildlife. The name “hummingbird” comes from the hum of beating wings—75 to 200 beats per second. Male hummingbirds are the smallest of all warm-blooded animals, weighing just 2.4 to 3.6 grams. Being the most versatile birds in flight, hummingbirds can hover as well as move up and down, left and right, backward, and upside down. Insects, spiders, and sugar are a hummingbird’s main diet. They migrate between July and October for food and warmth. Hummingbirds fuel up with flower nectar, feeding between five and eight times per hour, and consume approximately one-half of their body weight in natural sucrose per day. Access to hundreds of flowers is required for adequate nectar. Going one day without food can lead to a hummingbird’s death. Hummingbirds are durable travelers. The ruby-throated hummingbird flies nonstop for 500 miles within 18 to 24 hours in crossing the Gulf of Mexico. The longest migration is 3,000 miles from Alaska and Canada to Mexico by the rufous hummingbird. Out of the 325 species of hummingbirds, only 8 make the migration back and forth to breed in the United States. An additional 24 species visit the United States. Hummingbirds are listed on the International Union for Conservation of Nature’s Red List of Threatened Species due to loss of habitat. The public’s efforts in planting pollinator-friendly gardens and stocking clean feeders may increase the survival of hummingbirds. Lake Natron, located in northern Tanzania, petrifies all animals that fall into it. A photographer captured images of birds that were essentially turned into stone.